Continuity mistake: Strange is at home, looking for help on a video chat. His friend says no, and in his rage he sweeps almost everything off the table. Christine enters with food, we cut back, and the area of the table to his left, which was totally clear a second ago, now has several pieces of paper on it. Other mistake: When he rushes a patient to brain surgery they show him and the other doctor operating without surgical masks. When they cut away and come back they're wearing masks. Also, the doctor that is assisting him is an ER doctor, that would never happen in real life. Trivia: The envelope opened by Strange has the same year of birth as the release of Doctor Strange Vol. 2 #1 in 1974. Trivia: The sorcerors' wi-fi password, Shamballa, is a reference to the 1986 Doctor Strange graphic novel "Into Shamballa." Trivia: Mid credits scene: Thor pays a visit to Strange to help with Loki and find Odin. This scene takes place in the upcoming 2017 Marvel film Thor: Ragnarok. The Ancient One: We never lose our demons, we only learn to live above them. Dr. Stephen Strange: This doesn't make any sense. Question: When Dr. 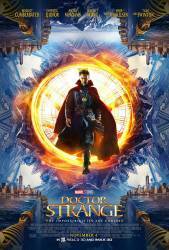 Strange gets into the accident near the beginning of the film, why didn't his car's airbag deploy? Wouldn't such an expensive car have all kinds of standard safety features? Chosen answer: The airbag did deploy. However, the deployment occurred when the car first crashed and we see the accident from the outside, so we can't see it. Once we get a shot of the interior, you can see the airbag is sticking out from the steering wheel, but (unlike what some movies would show you) airbags deflate very rapidly after a crash, so you may have missed it. Question: Why didn't Strange heal his hands and continue being a surgeon? Answer: For now, he is still in the midst of studying the mystical arts that he has not yet mastered and may not be able or interested in returning to his former profession at this time. He has also assumed the role as caretaker of the New York Sanctum, and is dedicated to helping protect Earth (along with the London and Hong Kong Sanctums) from threats by the other dimensions. Answer: Medically, he could not heal his hands. He spent his entire fortune trying to return to being a surgeon through experimental procedures. Once he completed his training to become a sorcerer, he realised there was more to the world than he realised. The Ancient One correctly stated that he was a surgeon for his own ego; he wanted to prove he was the best and helped people for that reason only. By joining the sorcerers he was given a greater purpose and chose this over returning to his former life.